Win some New Mum pamper treats! Anyone currently pregnant or due to be a new mum over the festive season deserves a bit of pampering. I certainly know what it feels like to be heavily pregnant at Christmas as my daughter was born on New Year’s Day! Christmas shopping was stressful trying to squeeze my tummy through busy aisles in shops although at Christmas I did get to put my feet up whilst others cooked the dinner. As a treat for new mum’s I have a few goodies to help with skincare, stretchmarks and multivitamins. See below for more details of the products. Combining organic Hemp Oil and essential fatty acids with Beeswax, Borage Oil, Horestail, Hops and Hibiscus which work together to effectively nourish and soothe the skin. The formula can be used on dry, damaged, sun exposed and sensitive skin, leaving it feeling intensely moisturised, instantly restored and visibly healthier all day long. The formulation contains 21 vitamins and minerals specially developed to give nutritional support for both mother and baby. It also contains Calcium and Vitamin D which are recommended for pregnant women by the Department of Health to support healthy growth and development of the baby’s bones during pregnancy. 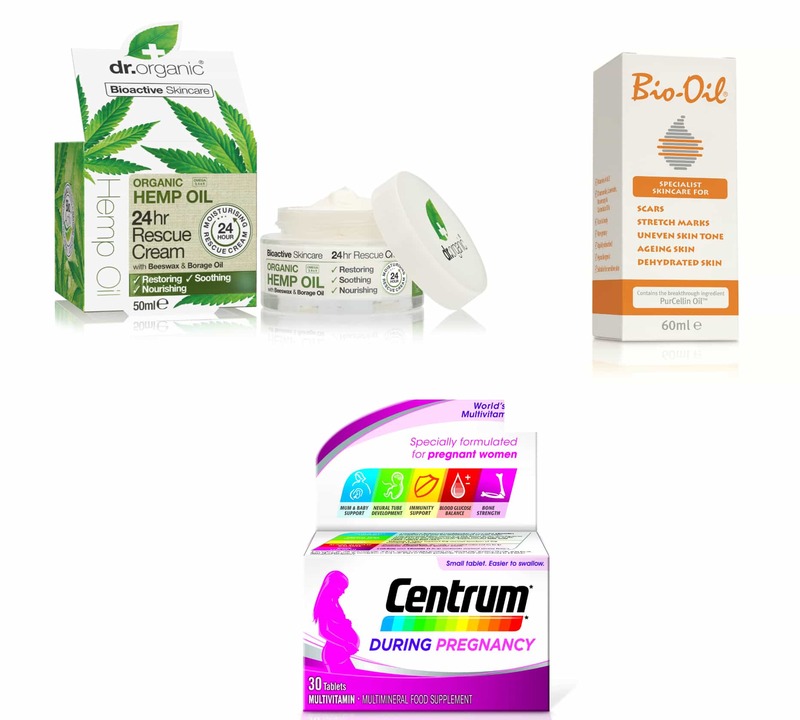 Centrum During Pregnancy also provides Iodine which is essential for brain and nervous system development.